Did you know April is National Volunteer Month? The Community Foundation, United Way of Washington County, MD, Court Appointed Special Advocates, Big Brothers Big Sisters of Washington County and Meritus Health are hosting the Washington County Volunteer Expo at Robinwood Professional Center on Wednesday, April 10th from 3pm-7pm. 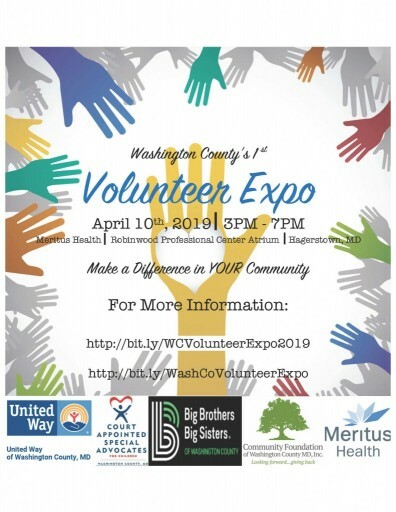 The Volunteer Expo is a free event for everyone in our community. Fifty-two nonprofit and volunteer-based agencies will be on hand to share with you what they do and how you can help! Register to attend one of three educational workshops.